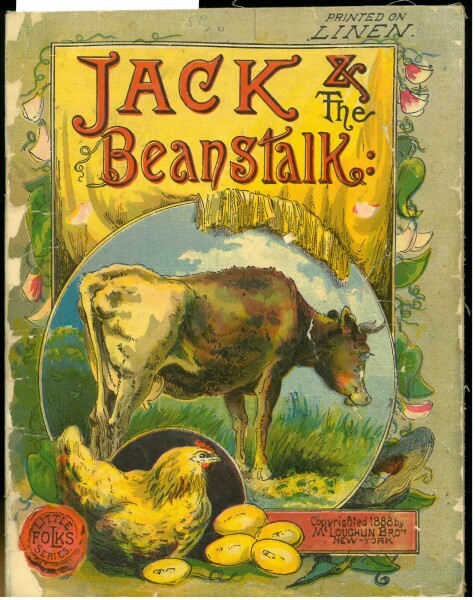 Jack and the Beanstalk (New York: McLoughlin Brothers, 1888). Linen in paper wrappers. Special Collections Children’s Literature Collection. The market for children’s books expanded dramatically over the course of the nineteenth century, as childhood mortality rates dropped and both literacy rates and disposable incomes grew. British and American publishers sought to take advantage of this demand by creating “indestructible” books that would appeal to the parents and teachers of very young children. Linen and muslin proved to be practical and appealing materials for such books. Early examples, such as The Indestructible Primer: Illustrated with Forty Pictures (circa 1850s) were often printed mainly in black and white, with comparatively crude pictures. However, by the 1880s, McLoughlin Brothers of New York were producing linen books featuring brightly-colored full-page images, with an aesthetic similar to the chomolithographic picture books they are so well known for. In the early 20th century, Dean & Son of London began a new series called Dean's Rag Books, which were printed on muslin. Rather than fairy tales or nursery rhymes, most rag books consisted of largely-independent images on each page, with single words or short captions, perhaps foreshadowing the infant-toddler market of today's board books. The heydey of cloth books came to its end in the mid-20th century, in part because cloth rationing during WWII shifted production towards heavy-duty paper options, such as the “linenette" books published by Samuel Gabriel Sons & Company. Cecil Aldin’s Farm Book. No. 217 (London: Dean's Rag Book Co., Ltd., 1920). Cotton. Special Collections Children’s Literature Collection.